Today that another CUUSOO project got archived after getting the 10.000 supporters, here we are to raise your attention for something we think worthwhile. Those of you coming here for long enough, might remember this old post about Theo Jansen kinetic sculptures. Besides the amazing nature of the artistic work in itself, these also became a popular inspiration for some LEGO builders who have recreated these, in several ways and forms with their LEGO bricks. 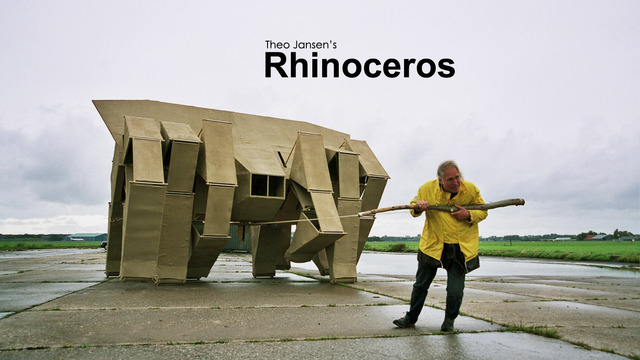 Theo Jansen is a Dutch kinetic artist, creating new forms of "life" since 1990. He is father to the "Animari" beach creatures, or "Strandbeests", made of PVC tubing, that walk the beach powered by the wind. As time progresses the Beests evolve, with the ultimate goal of living their lives on their own. 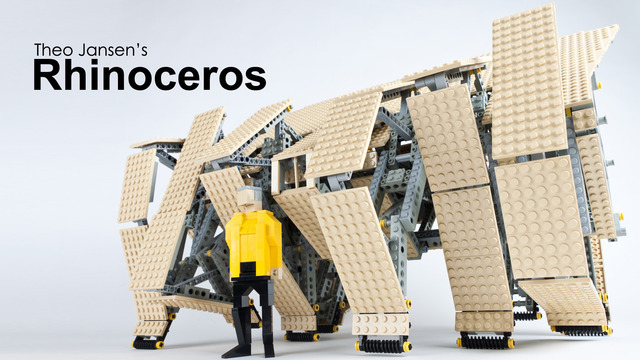 Now a young Dutch Industrial Designer (kvanb from his username) has made a LEGO version from Theo's Animaris Rhinoceros Strandbeest and submitted it as a LEGO CUUSOO project. This is another magnificent creation that I hope someday will reach the 10.000 supporters required to to enter the formal LEGO review and eventually make it an official model. Below a couple of videos about this model, one with Theo himself (who is also blessing this project) pushing the LEGO Rhinoceros to walk at his workshop. You can find some additional photos from this model, at kvanb's flickr account. Meanwhile another couple of videos from Theo's work, including a presentation by himself at TED2007 about his work. And finally you can now get your own Strandbeest (Animaris Geneticus Parvus) printed from a single step, as a 3D model by Shapeways (see also the "making of" video below). As we are fortunate enough to start getting a reasonable number of Technic oriented CUUSOO projects, I've decided to select a few well structured proposals and add them in a kind of random widget, running in the column at the right side of this blog, to highlight and raise attention to them. I'll keep adding some more in the next few days. Below the sample linking to the Rhinoceros Strandbeest. Don't forget to click and proceed leaving your support. IMHO not all of these projects fit entirely with the requirements (either complexity, business case or whatsoever) to pass a formal LEGO review. Nevertheless I opt to leave them up for your consideration and judgement.